If you have a collection of DVD movies or music DVDs and want to extract a chapter or make a full backup copy from a DVD to a video file in selected format, these are the DVD Copying and Ripping tools you might be looking for, and in this article, we will show you the best DVD Ripper with opensource freeware as well as commercial paidware. Calm down and continu read the artcile, you will find the one. If you want a fast, effective, and fairly user-friendly DVD-ripping solution, Brorsoft DVD Ripper is the way to go. This is an up-to-date DVD ripper software has flawless compatibility to all Windows OS (including the latest Windows 10) and Mac OS (including OS Sierra). More details please click the label on Contents. As we mentioned Ripping DVD, first freeware is Handbrake. 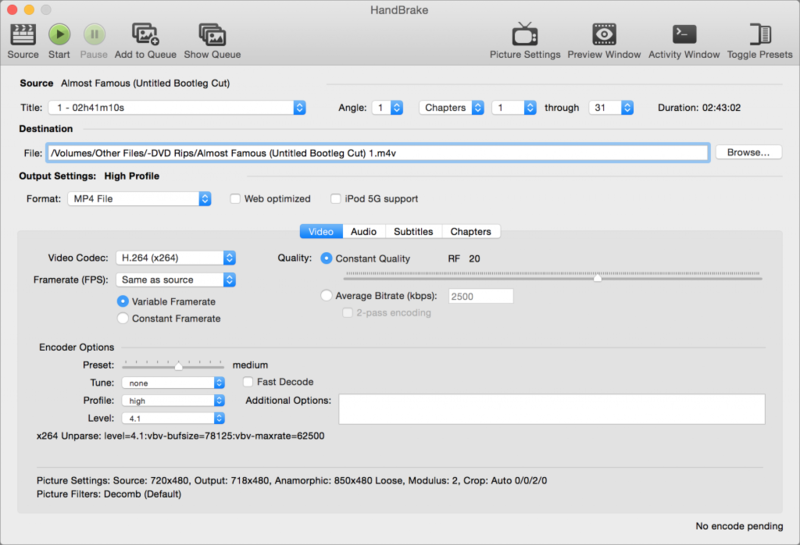 Handbrake is an open-source DVD ripper working under Mac, Windows and Linux, which can only convert DVDs to MP4 and MKV, with support for iPhone, iPods, Apple TVs,iTunes, PSPs, PS3s. But the DVD that Handbrake supported is homemade/unprotected only or can be played by your DVD player; it cannot rip commercial DVDs if without the help of third party software, not to mention the Disney new copy protections. In addition, Handbrake is not stable, sometimes even crash, especially when running on macOS Sierra. And if you would like to upload a commercial or home-made DVD movie to youtube.com video sharing website or to your web page or blog, HandBrake can’t help at all. For Mac user, you must be familiar with MacTheRipper, which is well known as a free DVD ripper (extractor) for Mac OS X.
MacTheRipper can removes CSS encryption, Macrovision protection, sets the disc’s region to ‘0’ for region-free as well as copy ARccOS copy-protected DVDs, and is capable of removing RCE region checking. That is to say MTR is able to backup your legally-purchased DVDs onto your hard drive. But it doesn’t encode its rips to other formats. It just rips the DVD menu and all to your hard drive in VOB file. It also needs a third party software to convert VOB to MP4, AVI or other formats. So if you would like to rip DVD directly to the format you desire, you’d better to take a look at MacX DVD Ripper Free Edition. It is able to rip DVD to your hard drive as video files or as an ISO image. Then you can burn the output files by integrating with Nero or other DVD burning software. What makes this program unique is its ability to compress DVD data to the standard 4.7-gig DVD. You will rarely, if ever, notice any decrease in video quality. The latest version was built in 2004. The UI looks “unfashionable” today. But personally, I like its considerate and friendly design very much. It lists the DVD structure including Menus, Main Movie and Unreferenced Materials. This means you can easily choose which parts of the DVD you want to ripping and shrinking. It’s a nice feature for you to leave out unwanted bonus features, audio data for languages, etc. DVD Shrink offers built-in decryption algorithms to “read” encrypted DVDs. Unfortunately, as it stopped updating in 2004, some recent copy protection methods are not supported. Rip DVDs and mucis CDs to video file as well as create ISO images. The strongest point of Format Factory lies in its support of converting numerous file formats, including video to video, audio to audio, DVD to video, and also image to image. The latest version supports 62 different languages which further makes it a global application. This program supports converting videos to mobile devices as can be seen on the top of the Video column on the left side. 20+ mobile devices or mobile device compatible formats are available, including Apple, Sony, Google, Nokia, etc. It’s really convenient for some folks who wanna playing various videos on their portable devices. In addition to converting videos, FormatFactory also acts as a DVD/CD ripper. Brorsoft Ripping DVD or Copying DVD at a reasonable quick speed. With a PC running on a CUDA-enabled Graphics card, or an AMD graphics card with AMD APP technology, the conversion speed of Brorsoft software is about 6X faster than other. Brorsoft provide copy DVD movie by 1:1 with original structures as well as directly copy movie ONLY from DVD (without extras, commentary, etc. )– better than any other DVD Ripping software. Brorsoft is very easy to use, even for beginners. It is true that the Brorsoft can rip the DVD just with few clicks. Brorsoft work without error and complete each task without glitches. Brorsoft also work well with other programs, such as DVD players and popular DVD burners. No matter how easy to use, occasionally some customers need support. Brorsoft provide excellent customer service. This service comes in the form of tutorials, FAQs and knowledgebase on websites, forum, blogs. If you can’t get an answer in those ways, you can keep in touch with Brorsoft via E-mail:support@brorsoft.com or Skype: emmalucky2 (Brorsoft_Emma). Conversion Choices – It extremely easy to convert a DVD for specific file types and devices(including Apple, Android, Windows tablets/smartphones, gaming systems, projectors, 3D devices, HD TV, media players, media servers, etc.). All you need to do is load your disc into the application, select the file format, device or service from the drop-down format bar, and start the rip. Ripping Attributes – Brorsoft perform conversions quickly, and the converted files all in high quality and a manageable size. The Brorsoft DVD Ripper’s interface intuitive and allow you to start a rip in three steps or less. Furthermore, Brorsoft able to extract audio clips from discs, capture subtitles and more. Hack DVD copy protection ability. What we need is DVD ripper software with excellent DVD copy protection hacking feature. It should has abilityh to backup any encrypted DVDs including older and recent ones and remove copy protection from DVD with Disney X-project DRM, Analog Protection, CSS, Sony ArccOS, CSS, UOPs and unlock region code. Customization Tools – Even the most exhaustive library of preprogrammed output profiles can’t cover the infinite ways that you can customize a video. Brorsoft DVD Ripper allow you to adjust technical aspects of videos, such as codecs, aspect ratios, bit-rates, frame rates and more, before you rip them.